Maybe you wouldn’t think so – or maybe you would – but teeth whitening is currently the number one requested cosmetic service, with its popularity continuing to soar according to the American Academy of Cosmetic Dentistry. Interestingly and unbeknownst to many, our teeth aren’t supposed to be bright, gleaming white – however, that doesn’t mean they should appear dark, disgusting and uncared for. There are many reasons for getting professional tooth whitening, the most popular being the boost to self-confidence and self-esteem that comes from a great smile; a younger appearance; a special event such as a wedding, job interview or class reunion; to make a positive first impression or to simply reverse years of staining and yellowing from foods, beverages and/or smoking. Before beginning any whitening procedure, be sure to consult with a dental tooth whitening professional such as those at All About Smiles Dentistry so he or she may tell you whether you are a suitable candidate for treatment. The saying is actually true! Even the science of psychology has proven that first impressions are lasting ones, and once you take into consideration making an impression on a first date, job interview or business meeting with clients, the importance of teeth whitening becomes more evident. 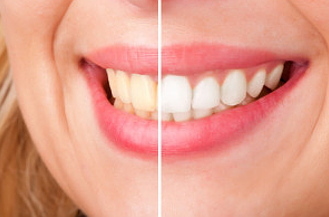 Yellow and stained teeth have shown to leave a somewhat negative first impression while noticeably white teeth have been associated with a positive and conscientious personality – and traits such as intelligence and reliability. Isn’t there always something we’re looking to improve upon when it comes to our appearance? Blame it on so-called “housewife reality shows” or the somewhat appearance-driven society we live in, which constantly evolves even further towards perceived perfection, but everyone seems obsessed with making themselves look “better.” The cost of tooth whitening, in this regard, is the most effective and painless option when it comes to cosmetic enhancements, especially when taking into account that cosmetic plastic surgery comes with a slew of risks, long recovery period and a hefty bill that’s not covered by health insurance. In stark contrast, professional at home tooth whitening delivers a dramatic difference in appearance without long recovery time, hassle or cost. With age comes tooth discoloration, and there’s no way around that. What’s worse, it can make you look significantly older than you actually are – but restoring your teeth to a whiter shade can provide injections of youthful appeal. Taking changing your style, hair or even makeup out of the equation, the best professional tooth whitening can make anyone look 10 years younger. If you have discovered that your pearly whites really aren’t radiating like they used to, a professional teeth whitening at All About Smiles Dentistry might just be the ticket that gets you smiling from ear to ear once more.